In the UK, Slade’s third album was called Old New Borrowed and Blue, but in the US, Warner Brothers made a slight miscalculation re-titling the record. Even though Stomp Your Hands, Clap Your Feet was a more apropos title for any Slade recording, the band’s third studio album showed a slight change in direction from their established and widely accepted formula, and quite honestly, it caught me by surprise. I’m guessing I wasn’t alone. ​Yes, the album had its share of rabble-rousing rockers with plenty of arena-style stomp and fan appeal to take it to No. 1 in the UK charts again, but the songs that made this album really interesting for me were the ones that showed Slade stepping (or should I say “lightly stomping”) outside of their known milieux. 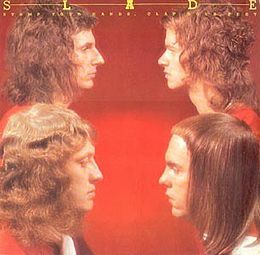 For instance, two of the album’s hit singles were piano driven and did not have the “typical” Slade sound. Even the lyrics, dare I say it? reflected a sensitive side to the band that main songwriters, Jimmy Lea and Noddy Holder had hinted at earlier with songs like “Coz I Luv You” and “Dapple Rose,” but had never really explored much beyond that. “When the lights are out. When I hear you sigh. ​OK, the lights are out. It’s a Slade song, and uncharacteristically the only thing happening is a breath of warm air so potent, “it makes me hit the sky.” Well, you know it does. The sladest Happy Medium Song of the Day in this ongoing tribute is, “When the Lights are Out” from the 1974 Warner Brothers release, Stomp Your Hands, Clap Your Feet.